If you are looking for a great way to save space in an already cramped bedroom then you might want to look into Murphy beds. 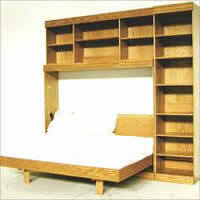 This is a type of bed that folds or flips up at the head of the bed for vertical storage inside a closet or a cabinet. There are some beds of this nature that have a design on the bottom so when they are folded they give the appearance of a closet space or cabinet but in fact it is a bed. These beds are not the same as the typical bed in that they do not have springs because of the need for saving space. 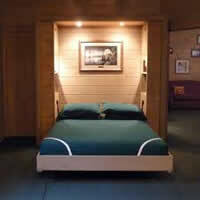 These beds are typically used in mobile homes and apartments but are rarely used in larger modern homes. This bed was created by William L. Murphy in 1916 and this is where this style of bed gets its name. He also started the Murphy Wall Bed Company and began production in San Francisco. In the 1990s Murphy changed the name of this company to Murphy Bed Co. Inc. These beds have been featured in many movies, typically those that movies that feature slapstick comedy with people getting stuck in the beds as they are folded up. Over time the folding bed has been changed many times and there are a number of variations of the bed on the market today. The less expensive variations are those that are enclosed by closet doors when the bed is folded. Instead there is a just a solid panel that appears to be part of the wall when the bed is up. There is another variation of the bed in which the head of the bed is on castors and the bed can be moved or rolled into any room as needed. This means that the bed can be moved in and out of the way when needed. Another popular name for a variation of this bed is the hideaway bed.